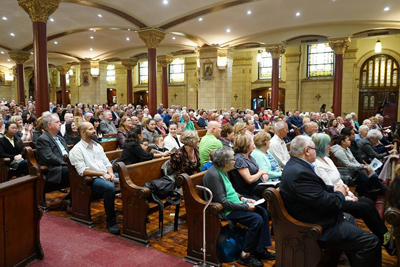 A homecoming Mass was celebrated October 28 in the lower church of the Basilica of Our Lady of Perpetual Help. Father Patrick Woods was the main celebrant, and Father John Murray was the homilist. This year marks 125 years of service to the people of God in Sunset Park, Brooklyn, through the venerable gray lady, Our Lady of Perpetual Help. On Saturday, October 28, as part of a yearlong jubilee celebrating the Redemptorist presence here, the parish welcomed back alumni of the parish and school. More than 500 people returned home to OLPH, including one woman who graduated from eighth grade in 1957. The homecoming celebration began at 3 p.m. with tours of the upper church. Having spent their adult years in other parishes and neighborhoods, many of those coming home said they had forgotten how glorious the Basilica was. Margaret Tyndall, the current principal, was on hand at the school to welcome visitors home. A small desk from the ’50s was used to remind former students what things looked like when upwards of 70 children stuffed the classrooms. Revealing how valuable the school and the parish facilities remain, the Regina Opera Company practiced in the auditorium as children led tours of the school. What followed was the real reason so many people felt refreshed, healed, and spiritually nourished at OLPH: the Holy Sacrifice of the Mass in the lower church. Father Patrick Woods, C.Ss.R., class of 1963, was the main celebrant for the Mass, and Father John Murray, C.Ss.R., class of 1961, preached. Also attending the Mass were a number of Sisters of St. Joseph, Brentwood, N.Y., who taught at the school for many years, as well as a few Mercy Sisters. Both Father Woods and Father Murray emphasized how the church, community, and school shaped and profoundly affected the lives of those who have been part of OLPH. 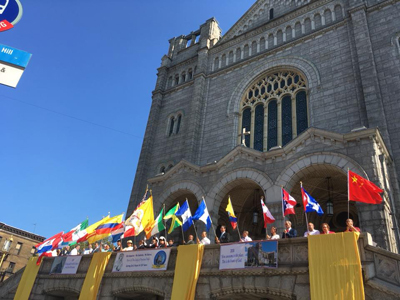 Flags from many nations fly in front of OLPH Basilica, showcasing the many cultures that make up the parish community. What is clearly seen, both then and now, is how proud, distinct immigrant and ethnic groups built and maintain this church. In the early days of OLPH they were Irish, German, and Italian immigrants; now they’re Dominican, Mexican, and Chinese families and individuals searching for a spiritual home. Weekend Masses are celebrated in four languages. If you went door-to-door, traveling just a few blocks north and south, east and west, you would encounter families from many countries. Their languages, food, music, homes, and values are as diverse as anywhere you will find in the world. Yet the communities come together, unified and integrated, at Our Lady of Perpetual Help. The celebration of 125 years of the men and women of Our Lady of Perpetual Help goes beyond nostalgia and sentiment to witness. OLPH continues to be a place of encounter with our Savior and his glorious mother! As you stand on the corner of 59th Street and 5th Avenue, looking up at this magnificent church named for the Mother of God and in your mind’s eye seeing the past century, you can truly say, “I looked, and there before me was a great multitude that no one could count, from every nation, tribe, people, and language, standing before the throne and before the Lamb” (Revelation 7:9). For more information about the homecoming, see Marie Elena Giossi’s article in The Tablet, the newspaper of the Diocese of Brooklyn.